We bowled first and bowled great… And they kept running themselves out. One pair ended up at the same end and began a fight between themselves , as to which one was actually out, which lasted twenty minutes . It didn’t seem that anyone really knew the rules, least of all the umpire and then it degenerated into the nearest thing to a proper fight I’ve ever seen on a cricket pitch with their bloke on the verge of tears and hysteria telling everyone to go away then trying to fight our opening bat who politely and completely understandably….told him he was an utter idiot and to get off . Anyway, on to our batting: Chasing 134 to win ….Ash …. In Brearley like … left field … intuitive mode ….asked this bloke who no one seemed to know …or had seen play …to open (Big Carl.) Left handed and made Ben Stokes look like Chris Tavare … He battered (the only verb that does this justice) the ball to all parts of Sharjah. And I mean battered and I mean all parts. 11 overs later … It was all over with Carl 81 not out off 39 balls . As the teams shook hands , the idiot who was trying to fight in the first innings came over to have another go making an even bigger idiot of himself than before . My little lad Joe asked quietly if he could over and punch him and although tempted , we set sail for Dubai. 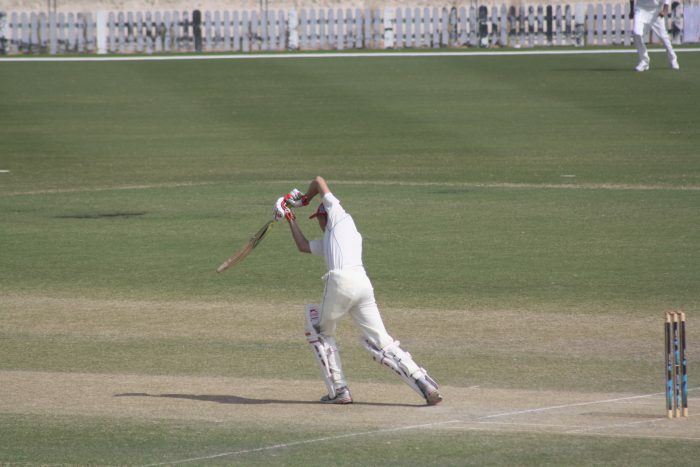 This entry was posted in Club News, Cricket and tagged Amateur Cricket, Cricket in the Middle East, Cricket in the United Arab Emirates, Cricket Match, Match Report, News, Sharjah, Skyline University. Bookmark the permalink.